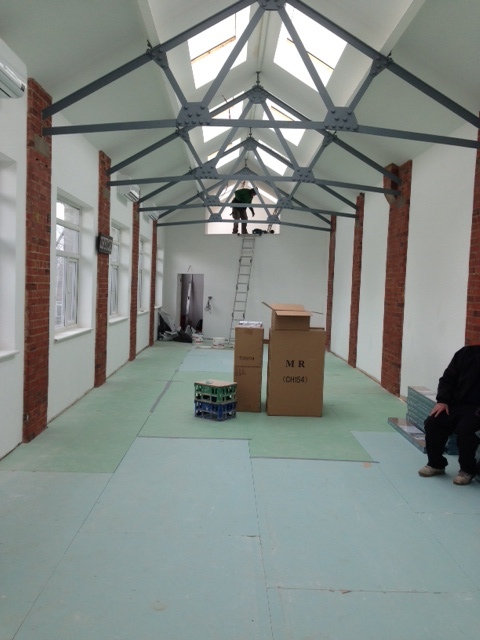 Fifteen weeks down the line and another three weeks to go before our building should be finished and it’s looking FAB!!! I must stop boring people with our beautiful building in Barnet! It’s truly awesome and now coming to life, which is so exciting. I think for the last 20 years it’s been bored and unloved. Abused and forgotten, neglected and left to grow old, cold and damp. And now we’re breathing life back into it and it’s rewarding us by surprising us everytime as we chip away at the old crumbling walls, revealing wonderful Victorian brickwork that’s strong and robust – with not just 9 inch thick walls but 12 inch thick walls – and huge big struts that we’ve painted a lovely grey. We’ve punched as many holes into the roof as we can to cast as much light as possible so that we capture the sun from the East, South and West. Not that I’m obsessed by light but actually I am! Where the previous tenants had covered over windows we’ve reglazed them to let even more light in – and Wow is this building responding. The sunlight is casting shards of light at every opportunity even with all the dust and grime that’s been created from the plasterers it all adds to the atmosphere – almost like a party’s about to happen and it’s all hands on deck to prepare for it. Little did Neil and I realise when we walked around the grubby, derelict building that it was like an old shell waiting to be stripped down to its original beauty. 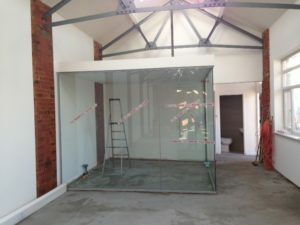 It’s still hard to imagine what it could be like when it’s finished – but the plasterers have just finished , the toilets and shower are in, the kitchen has been fitted and my adorable friend Donald from GlassEco has given us an off-cut for our kitchenette – made from recycled glass. 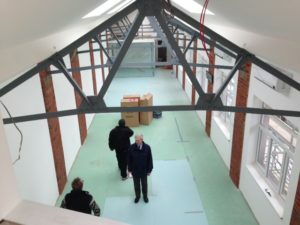 The columns in our office have been sandblasted and 3 new velux’s have gone in the snug with 2 that open into balconies. When I should have been doing some work this afternoon, I couldn’t resist buying a spiral staircase today for the snug – now that’s exciting too – I’ve always wanted a spiral staircase and now I actually have an excuse to buy one. That will be fitted by the end of the week. The very sad space downstairs which really offered little promise of anything apart from a garage for a mechanic is also coming up trumps. We’ve decided to split the space into two units, so with two shower rooms and two kitchens we’ll be able to rent them – genius! As the units come along I’ll also post up pictures of it – we’ve punched another place for a window and done a lovely paint job so far. Today we decided to put down a cheap wooden floor to make it look even nicer. Oh yes, you’ll also see in our office we’ve put in a glass board room – it’s a bit like a glass cube – but absolutely perfect except it’s not sound-proof – so Neil tells me it’s a total waste of money!!! Little does he know we’ve wasted money in other places too!! Can’t wait to show you more pictures once the spiral staircase goes in! !